From all of us at CCF SoCal, thank you for loving cheetahs and for your continued support! Don't miss your chance to be a part of the Cheetah Conservation Fund's fall tour. For more details and ticket information go to 2018 Disappearing Spots Fall Tour. 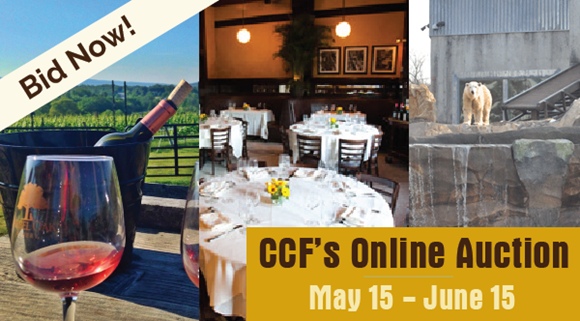 Cheetah Conservation Fund's Zoo partners have offered up some great experiences for our Summer FUN Online Auction. Go behind-the-scenes at the Columbus Zoo and Aquarium in Ohio, take part in an Elephant RendeZoo at Dickerson Park Zoo in Missouri, or feed the birds at Tracy Aviary in Utah! Bidding starts May 15th, 2018 and goes through June 15, 2018 at 10:00 PM EDT so visit our auction and claim your summer plans now. CCF Receives 4-Star Rating for 3rd Consecutive Year! Charity Navigator is a nonprofit organization that objectively analyzes the financial health, accountability and transparency of American charities. In order to help donors make more informed choices, Charity Navigator assigns ratings to nonprofits based on a scale of performance over a set list of criteria. Charity Navigator has awarded only the most fiscally responsible organizations a 4-star rating and only a quarter of charities rated by Charity Navigator receive the honor. 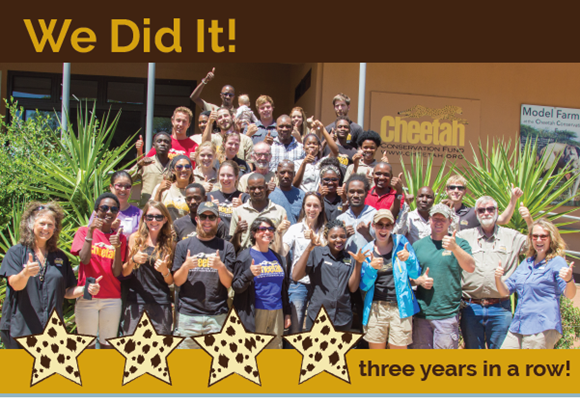 2018 is the third consecutive year that Cheetah Conservation Fund has earned this top distinction! This adds CCF to a preeminent group of charities working to overcome the world’s most pressing challenges. Based on our 4-star rating, CCF’s donors can trust that their contributions are going to a financially responsible and ethical charity. Attaining a 4-star rating verifies that CCF exceeds industry standards. Only 21% of the charities evaluated by Charity Navigator receive at least 3 consecutive 4-star evaluations, indicating that CCF outperforms most other charities in America. WASHINGTON, D.C. (March 13, 2018) – Cheetah Conservation Fund (CCF) Founder and Executive Director Dr. Laurie Marker will launch a six-week tour with public and private speaking engagements in the U.S. with back-to-back events in Denver and Aspen, Colorado, on March 13 and 14, 2018. The theme of this year’s tour is “Disappearing Spots.” The theme refers to the 2016 landmark cheetah population study co-authored by Dr. Marker that identified the species’ swift decline and estimated the remaining population to be just 7,100 – down from 100,000 a century ago. Traveling from her CCF Field Research and Education Centre in Namibia, Dr. Marker will talk about the plight of the cheetah and threats the species faces in the wild. Problems like human-wildlife conflict, habitat loss and loss of prey, and illegal trafficking have made the cheetah the most endangered big cat in Africa. Dr. Marker will also speak about her life’s work, including the research, education and highly successful conservation programs of CCF that helped make Otjiwarongo, the town where CCF is based, the “Cheetah Capital of the World.” Dr. Marker’s most recent publication, CHEETAHS: Biology and Conservation, a comprehensive textbook she co-authored and co-edited, will be available for purchase at all tour dates, with a portion of proceeds supporting cheetah conservation. By increasing public awareness of the cheetah’s situation, Dr. Marker believes people can make all the difference and help the world’s fastest land mammal outrun extinction. March 28 and 29 – Washington, D.C.
Dr. Marker is available for media interviews while traveling on her tour, and media are invited to attend her presentations. Please inquire for details. Right: ​Dr. Laurie Marker, pictured in the center, joins in the World Wildlife Day festivities with Ethiopian government officials and wildlife organisations. The posters, developed in collaboration with CCF, being held are part of a PSA from the US Department of State’s Regional Environmental Office for East Africa, focused on raising awareness for the illegal trade in cheetahs. ​ADDIS ABABA – 7 March 2018 – Dr Laurie Marker, Founder and Executive Director of Cheetah Conservation Fund (CCF), and Assistant Director for Illegal Wildlife Trade, Patricia Tricorache, travelled from Namibia to Ethiopia and Somaliland during the first week of March. The two held a series of meetings with local government officials and wildlife organisations to discuss the illegal trade in cheetahs. Ethiopia and Somaliland, an autonomous region of Somalia, are areas of concern due to the high numbers of cheetahs smuggled through these countries into the Arabian Peninsula to supply the illegal pet trade. In Somaliland, Marker and Tricorache met with the Minister of Environment and Rural Development, Hon. Shukri H. Ismail, and her staff. During three days of meetings, they discussed progress being made on strategies devised in April 2017, which include awareness campaigns, capacity building for law enforcement, and the development of a sanctuary to shelter confiscated wildlife. They also met with the Dean and Faculty of University of Hargeisa’s College of Agriculture, Veterinary and Animal Science, to assess the school’s expertise and laboratory facilities. The two organisations agreed to collaborate on emergency care for confiscated animals. They also identified areas where additional training is needed. 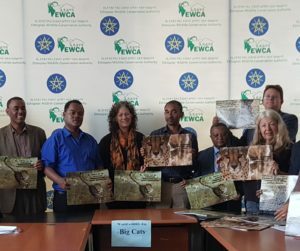 In Ethiopia, the pair met with Director General Kumara Wakjira Gemeda of the Ethiopian Wildlife Conservation Authority (EWCA) and representatives from the US Department of State’s Regional Environmental Office for East Africa. The meeting coincided with EWCA’s celebration of World Wildlife Day, and culminated with a ceremony to mark the occasion. Director General Gemeda emphasised the importance of Ethiopia’s mandate to conserve its rich wildlife and affirmed his office’s commitment. Posters developed by the U.S. Regional Environmental Office were presented to attendees. The posters, developed in collaboration with CCF, depicted images of cheetahs and included messages in Somali language relevant to the illegal cheetah trade. CCF began working with EWCA and the U.S. Embassy in Addis Ababa when it began its efforts to combat the trafficking of live cheetah cubs out of the Horn of Africa in 2005. Since then, a larger coalition of government entities and international NGOs have joined their efforts. “Encouraging cooperation between the areas in the Horn of Africa along the trafficking route into the Arabian Peninsula is a crucial element of our work. We are grateful to the governments of Ethiopia and Somaliland for their active involvement in these efforts”, said Dr Marker. “It is important to remember that live animals poached for the illegal trade are in most cases unable to return to the wild, and thus, they cannot contribute to conservation of their species. Although their images do not generate the same emotional reaction as those of elephants and rhinos killed by poachers, the impact of their loss is felt just as much”. Since 2005, in Ethiopia and Somaliland, over 50 cheetahs have been confiscated from poachers and smugglers, along with many other wild species. Currently, CCF associates in Somaliland are caring for more than 30 animals confiscated by regional wildlife officers, including three cheetahs and five caracals. The centre is phase one of a longer-term effort to house confiscated cheetahs. which requires a larger investment to provide appropriate enclosures, specialized care and round-the-clock security. For more information or to donate to the project, please visit www.cheetah.org. ​OTJIWARONGO, NAMIBIA (2 March 2018) — Cheetah Conservation Fund (CCF), the leading organisation dedicated to long-term cheetah survival, is pleased to join the United Nations and many other organisations around the globe in marking Saturday, 3 March as the 6th Annual World Wildlife Day. A day dedicated to wildlife and intended to bring attention to the plight of wild animals on our planet, this year’s theme is “Big cats: predators under threat”. “Cheetahs, just like lions, tigers, leopards and jaguars, are facing multiple threats to survival. But cheetahs are the most endangered of all big cat species in Africa, and they are disappearing at an alarming rate”, said Dr Laurie Marker, Founder and Executive Director of CCF. “Over the last century, we’ve lost more than 90-percent of the world’s wild cheetah. If we don’t do something now, cheetahs could become extinct during our lifetimes”. In Namibia and in many other parts of Africa, cheetahs are threatened by conflict, habitat loss, loss of prey, poaching and the illegal trade. Most of the problems are caused by human activities. To counter, CCF has developed a holistic approach to conservation, considering the needs of people, livestock and wildlife sharing the landscape. In Namibia, CCF’s programmes help people and wildlife co-exist. CCF deploys a range of programmes to successfully conserve cheetah, utilising tactics rooted in science and data supplied by its own research teams. CCF’s Future Farmers of Africa trains Namibian men and women in integrated livestock-wildlife rangeland management. The course develops rural livelihoods by training farmers in how to best manage their rangeland, livestock and wildlife to reduce conflict with predators. CCF instructors explain how to increase profits by providing livestock with basic veterinary care and how to protect cattle during calving seasons. To reduce conflict, CCF places CCF Livestock Guarding Dogs with farmers to serve as non-lethal predator control tools. Farmers with CCF dogs are less likely to have conflict with cheetahs, and they report a decrease in predation losses ranging over 80 percent. Each year, thousands of young learners are impacted by CCF’s Future Conservationists of Africa presentations offered in schools and onsite at its Field Research and Education Centre near Otjiwarongo. By teaching students about wild species from a young age, they are more likely to grow up and become conservationists and stewards of wildlife. CCF also builds capacity in rural communities, training residents to become eco-tourism guides and artisans that produce hand-crafted jewellery and art to sell to tourists. By educating people and proving economic value in having wild cheetahs as part of the landscape, CCF has helped reduce the decline of cheetahs in Namibia to human wildlife conflict. However, the cheetah population is still on the decline due to a variety of factors including habitat loss and fragmentation and conflict with larger predators in the landscape. “World Wildlife Day 2018 provides an opportunity to raise awareness for the plight of the cheetah and rally people’s support for this iconic big cat. I invite everyone to visit CCF to learn more about the cheetah and the programmes we’ve developed to help save them. We hope you will join us in the fight to save the cheetah, so we all can enjoy this majestic creature for generations to come”, said Dr Marker. Cheetahs are the most endangered big cat in Africa. Over the past century their numbers have dropped by more than 90-percent. The most recent study estimates the remaining wild population of adult and adolescent cheetahs to be just 7,100. The cheetah is built for speed. With a light-boned frame, long legs and a tail that serves as a rudder, cheetahs can reach speeds of up to 110 km per hour. Cheetahs can accelerate and change direction faster than any other land animal. Cheetahs are carnivores and prefer to hunt smaller antelope, like springbok, steenbok, and duiker and the young of larger antelope, like kudu and Oryx. Cheetahs are considered the best hunters on the savanna. Ninety-percent of Namibian cheetahs live on farmlands and hunt by day, which makes them vulnerable to conflict with farmers. Cheetahs live in low density over large home ranges covering areas on average of 1,500 km2. In addition to human wildlife conflict, cheetahs are threatened by habitat loss and loss of prey throughout Africa. These problems are exacerbated by climate change. Cheetahs are also threatened by the illegal wildlife trade. Each year, an estimated 300 cubs are poached in the Horn of Africa to be sold as pets on the black market (primarily in the Gulf States). Sadly, five out of six poached cubs die in the hands of smugglers. Namibia has the greatest density of cheetahs of any nation on Earth, which is why Otjiwarongo, the town where CCF is based, is known as “The Cheetah Capital of the World”. ​CCF has several publications for people who want to learn more about the species, including Chewbaaka, an illustrated children’s book; A Future for Cheetahs, a coffee table book with text by Dr Marker and photos by wildlife photographer Suzi Eszterhas; and CHEETAHS: Biology & Conservation, a comprehensive textbook co-authored and co-edited by Dr Marker and a team of international researchers. WASHINGTON, D.C. (Nov. 29, 2017) – Cheetah Conservation Fund (CCF), the longest-running research, education and conservation organization dedicated to saving the wild cheetah, and the Association of Zoos & Aquariums (AZA) are leading seventh annual observance of International Cheetah Day on Monday, Dec. 4, 2017. What began as a day to generate awareness for the plight of the cheetah — Africa’s most endangered big cat – International Cheetah Day has become an occasion for all people around the world to celebrate this unique feline icon of speed and grace. International Cheetah Day has also become an opportunity to educate young learners about the importance of conservation through school projects and zoo talks and to encourage entire families to get involved with local conservation initiatives. CCF and AZA are encouraging zoos and schools around the world to help spark young people’s interest in conservation by recognizing International Cheetah Day with cheetah-themed activities and classroom lessons. Teaching and outreach materials, including a downloadable activities packet designed for elementary-aged schoolchildren and a PowerPoint presentation with notes, can be accessed through CCF’s websites, www.internationalcheetahday.org and ww.cheetah.org. Cheetah photos, videos and social media links are also available for download. Learn about cheetahs – click here and scroll down the page to see our cheetah facts. Participate in one of the ICD events listed on our site here. Get yourself a Save The Cheetah International Cheetah Day shirt from our Bonfire fundraising campaign. Read Freeda The Cheetah by Picklefish Press! The Kindle version is free to download on Amazon. Download the Conservation Passport. When you finish the activities, print out your very own Certificate of Cheetah Achievement! Join the conversation on Twitter by using hashtags #Loud4Cheetahs, #SaveTheCheetah, & #IntlCheetahDay. Use our Tweet Sheet to send tweets simply and easily. Just log in to your Twitter account and then open the Tweet Sheet. Click the TWEET button to instantly post to your Twitter page. 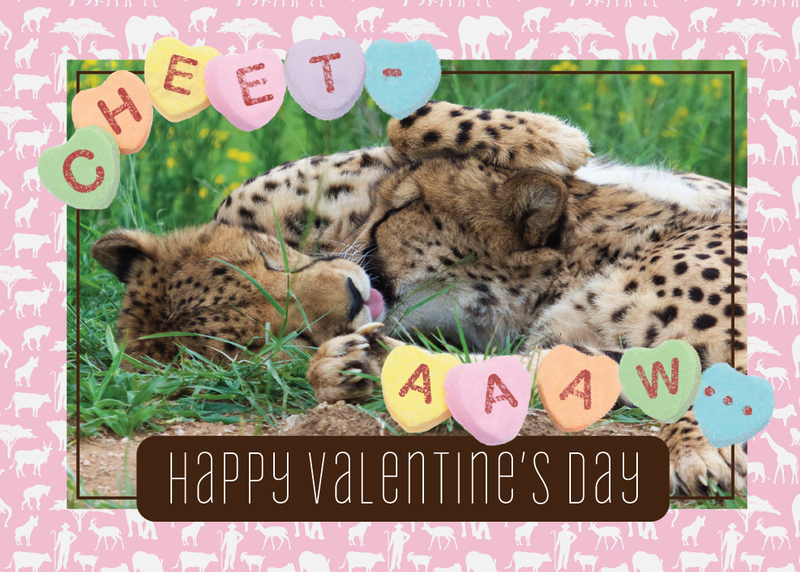 Share a cheetah image on your social media profile for the day, week or month. Share this special International Cheetah Day video message from TV’s Born to Explore host Richard Wiese. Visit the places where cheetahs live. Visit a zoo on December 4th or plan to visit Africa (many conservation organizations gladly accept volunteers and interns). There are conservation organizations working in research facilities, around the world and in the field, to help save the cheetah. They need YOUR help, so please consider donating to one of the organizations that is making a difference TODAY! ​Dr. Marker is an internationally recognized expert on the cheetah. She designated Dec. 4 as International Cheetah Day in remembrance of Khayam, a cheetah she raised from a cub at Wildlife Safari in Winston, Oregon. Dr. Marker brought Khayam to Namibia to determine if captive-born cheetahs could be taught to hunt. Their efforts were successful and eventually the pair returned to Oregon. But during this trip, Dr. Marker witnessed African farmers removing wild cheetahs from the landscape as a perceived threat. In 1990, she launched CCF and relocated to the newly-formed nation to mitigate the problem of farmer-cheetah conflict. Because of her interactions with Khayam, Dr. Marker dedicated her life to becoming the cheetah’s champion, and she chose Khayam’s birthday for this important honor.